How time has been flying lately, I still can’t believe it’s December already. And in a week’s time we will be brining in the new year, 2016 should be an interesting year. Things are in full bloom around here, the tree has been up for a while now, lights didn’t need stringing (benefit of a already strung tree), and gifts are out. The fireplace greets you with a push of a button, such a great thing on cool nights. My last post was some time ago, so lets just go through a bullet point time warp at lightning speed. Finals for me are done, I completed them all by Wednesday last week, so that means freedom for I believe 6 glorious weeks. In that time I think I slept maybe 12 hours in a week. I still have been wearing some of my knits, today I’m planning what I’ll be wearing to the family dinner. Christmas knitting has been done for a month or two. That one item is the Viajante made out of Miss Babs Kilimanjaro in the color, Believable. That is the only thing that I knit for the holidays, because I am not going to knit up a storm for everyone, I wanted to enjoy my knitting time. Strönd is done, seams, ends, and all. It is very comfy and I really like how it turned out, the colors are subtle from a distance. But when you get closer you see how the yarn just plays with color. It’s now been over 4 months since I bought yarn. I almost fell last Friday, to some gorgeous silk I have been petting for weeks. I almost fell again yesterday to the same yarn, but I was told to put it on hold for a few days so I can really think about it. I think I’m ready for a drink. As most of you are aware, California is not the coldest place in the world and especially last year fall/winter wasn’t much either. This year we are getting much cooler weather which I’m thoroughly enjoying. I even wear a scarf on occasion when I know it’s going to be chilly. Yes that’s right, I have actually been wearing stuff that I’ve made and it’s been bliss. My coworkers get scarf envy every time they see me wearing anything I’ve made. So fair it’s been my first color craving, my third as well, sari, and masgot. I might even pull out a light sweater or cardigan at some point, but two that I want to wear need buttons still. One I’ve had buttons for a while now (cough, two years, cough) and the other never had buttons waiting for it. I think that will be remedied soon. I went though my stash again last week and it surprised me with yarn that I forgot that I had. I went through almost all of it and was like oh I forgot about that and that and oh boy. I had a whole large bin of sweater quantity yarn that is not tosh or any hand dye. And there’s a few of those in sweater quantities too. I think it’s time to get down of my stash up for destash and get it to a home where it will be loved and knit with instead of lingering in my stash. It will be hard to do so, but I just have so much that I just need to. I think I’m going to have to knit a lot more out of the sweater quantities too. I have a lot of good sweater yarn that it’s insane and even a coats worth too. Which sounds insane for California but I’m going to make it and hopefully wear it in a colder climate. Maybe if I take a quick vacation in January I will go somewhere, where it’s cold enough I could wear something like that. Or the very least a nice wool sweater. As for Strönd, back and first front is done. 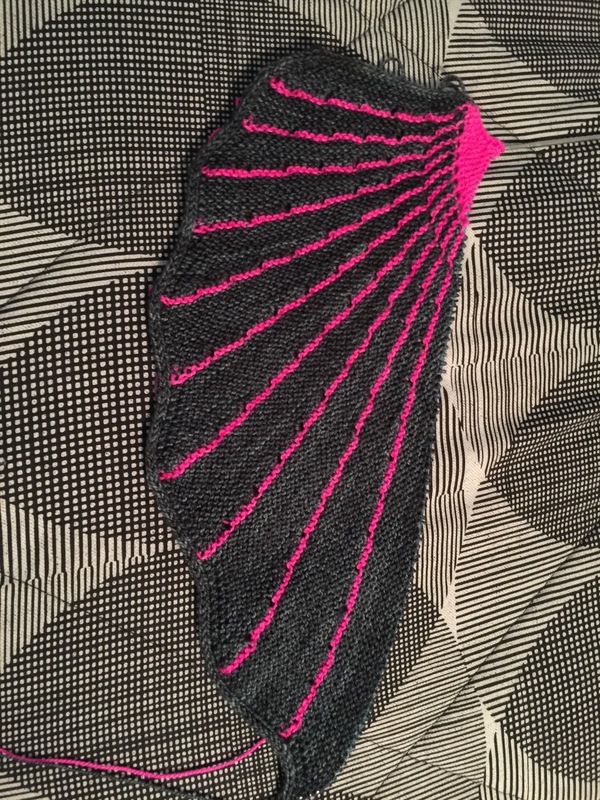 Completely off the needles and ready for blocking. The second front is on its way, going up to the underarm. I hope I can finish it this week so that I can wash and block and maybe even wear it. I forgot how fast worsted weight sweaters/vests/anything on a US 8 (5.00mm) goes. Though I will admit the honeymoon fase of the project has worn off and now I just can’t wait for it to be completed. So then I can cast on the next project, which I have picked out I think. However there are some other projects that I need to work on first, some that have a self imposed time line. No, those are not gifts, I only made one thing for a gift and the recipient knows about it already. In the interum of finishing Strönd I did cast something on. Something that is neon, was a mystery, and is again using more of my stash. I cast on the Doodler, yes I said I wouldn’t, that I wasn’t sure about it. But I saw a picture of one done and blocked and I liked it more then I thought, though I still might edit the pattern a little bit. But that is for me to know and you to find out if I decide to go ahead with the edits. My colors so far are Fog and Fluro Rose, the third I have picked out but I’m waiting to see if I actually want to use that one at the end.